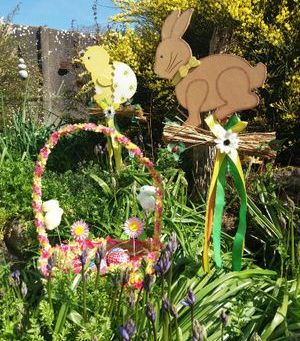 between 12th & 29th April will receive a free Easter Egg Hunt around the enchanting Fairy Garden. Don't delay, book your stay today! The World's 1st Self Catering Pub, Conroy's Old Bar is where family memories are made. Normal Booking T's & C's apply.Offer cannot be exchanged for cash. Only ONE family egg hunt per booking.Only available for Family Bookings. As we've been having such considerate/respectful guests of late, we've decided to have a trial reduction of our Damage Security Deposit from €250 down to €150. We'd also like to mention, that when we have respectful guests making a return visit, we have found that we have had no need to charge these guests a damage security deposit on their return. Even though Conroy's Old Bar tends to attract a certain type of guest who prefers to "get away from it all"; and the kind that are not bothered with watching tv, we decided it was about time to upgrade the little portable T.V that has served us so well over the last decade or so. We now have a 32" flat screen tv, discreetly hidden away in the "chest of drawers." We've also recently upgraded the shower in the shower room. 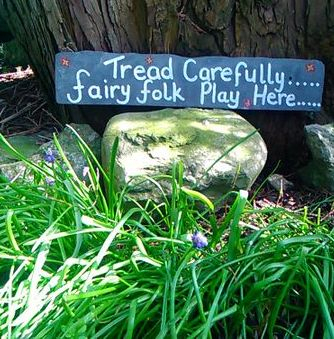 The Fairy Garden is currently being updated due to the arrival of even more fairy folk. These works will be completed by late spring of 2019. New solid fuel stove installed. Guests are now even cosier with the addition of the new solid fuel stove. It's a lot cleaner and far easier to control than the open fire that was. And guests are delighted by the fact that they can safely light a fire before going out and return later to a warm cosy fire that's still lit. For those who haven't the first notion about lighting a turf fire, no worries, we're on hand to give you all the instructions you'll need. Sign Up To AIRBNB and Receive €35 off. For Sale - It's Time for a Change. as a condition of sale. Whether they be Previously made Bookings or New Bookings. bookings will be honoured by ourselves, BEFORE we will complete on the sale of the property. We have loved our life here in this sleepy village, with it's laid back lifestyle away from the hustle and bustle. But after 14 years, the time has come for us to move on with the next chapter of our lives and we have decided to put our home and Conroy's Old Bar on the market for sale. So, if you're looking for a completely new lifestyle, and a slower pace of life, in a friendly rural village, in the heart of Ireland, where your early morning alarm is the dawn chorus, where the norm is for complete strangers to pass the time of day with you and where the night sky comes into it's own; due to the lack of light pollution, where you have the chance to earn an income from Ireland's most famous & unique self catering accommodation, meeting guests from all over the globe and welcoming the randomness that owning The World's 1st Self Catering Pub brings with it. 5 Bed House Plus a Separate Self Contained Unique 2 Bed Self Catering Holiday Let. Situated in a small village close to Lough Derg & the River Shannon in North Tipperary. On the border of Counties Galway, Clare & Offaly, in Ireland's "Hidden Heartlands". A truly unique property offering an All Year Round Income from The World's 1st Self Catering Pub. Featured on RTE 1 Nationwide and also in major National Irish Newspapers, major International Newspapers, plus numerous other newspaper, radio & media features around the World. Then look no further, check out our website below for full details. 2 Bed Self Contained Unique Holiday Let, with all year round income. 2 Stone Built Workshops (with power/elec). 31ft Serviced Mobile Home (converted to workshop and display area). Private Tree Lined Rear Garden. Phone Lines & Internet to Both Properties. Full UPVC Double Glazing to Both Properties. Dual Fuel Central Heating to Both Properties. All set on Approx half an acre. or perhaps having a picnic in the lovely children's seating area. you stay in a converted, original Irish village bar. which you have to yourselves for the duration of your stay. Conroy's Old Bar sleeps MAX. 4 +cot. On Monday 15th February 2016 Conroy's Old Bar featured on RTE's Nationwide programme.